Each summer, Lotus engages the community in an annual art-making project connected to cultural traditions around the world. The Visual Arts project is based on a specific theme; examples of past themes include mask-making, drawing cultural symbols, creating African-inspired banners, and more. 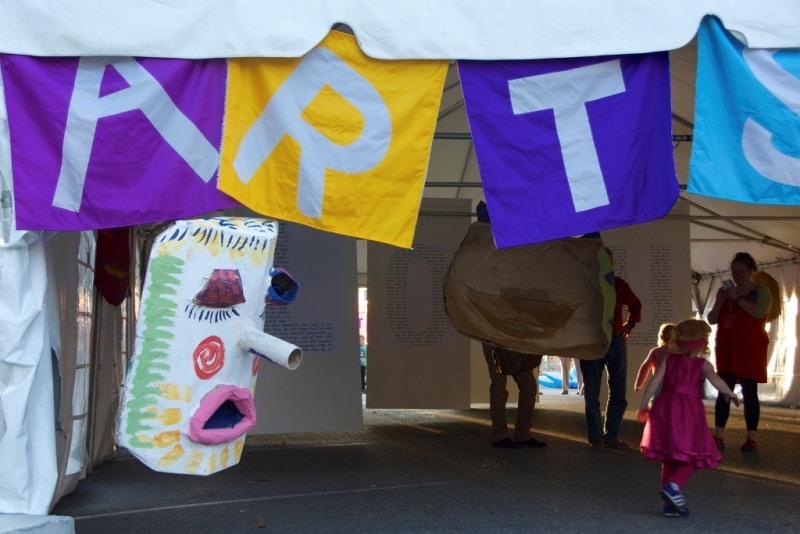 Art-making happens in public workshops, events with non-profit partners, as well as directly with social-service agencies and organizations reaching underserved populations such as at-risk youth, seniors, and participants with special needs. The final product is an installation in the Festival Arts Village at the annual Lotus World Music and Arts Festival, allowing participants to see their creativity proudly displayed for enjoyment by the whole community. In some cases, a Visual Arts Outreach project will extend beyond the summer and span an entire program year. Examples include the 2013 Power of Pattern initiative and the 2016 One Million Stars project. engaging participants through a themed, hands-on art experience designed to reflect the interests and needs expressed by partner agencies. providing project materials and workshop sessions free of charge. bringing the workshop sessions to the organizations and their clients. providing disadvantaged youth the opportunity to work alongside practicing professional artists, learning new skills and receiving one-on-one feedback. situating participants in a global context and encouraging participants to learn about – and contribute to – world cultures through the creation of artwork and personal identification with new themes or modes of creative expression. creating avenues for participants of all abilities, backgrounds, and learning styles to become invested in being part of the larger community and interact with others from diverse or unfamiliar cross-sections of the community. empowering participants through opportunities to express themselves creatively and explore their ideas, talents, and curiosity through the arts. celebrating contributions from everyone in the community and fostering a sense of pride through public display and acknowledgment of their work and creative contributions.